A friend of mine and I decided to spend ten days eating our way through southern Germany and Austria - to get under the skin of what they actually ate there. I have never eaten or drunk so much on one of my trips. It was bliss. And it all started in Munich. It is a grand city, befitting its status and importance. But it has a low grace. Like Madrid, the buildings don’t overshadow or rise up so as to block out the light. The architecture is as varied as the sausages. Many hours were spent walking around Munich’s various avenues and colourful boulevards and parks. Overeating provided a pleasurable excuse to do little more cultural than take in the Bavarian air and peruse the finery the city had to offer. 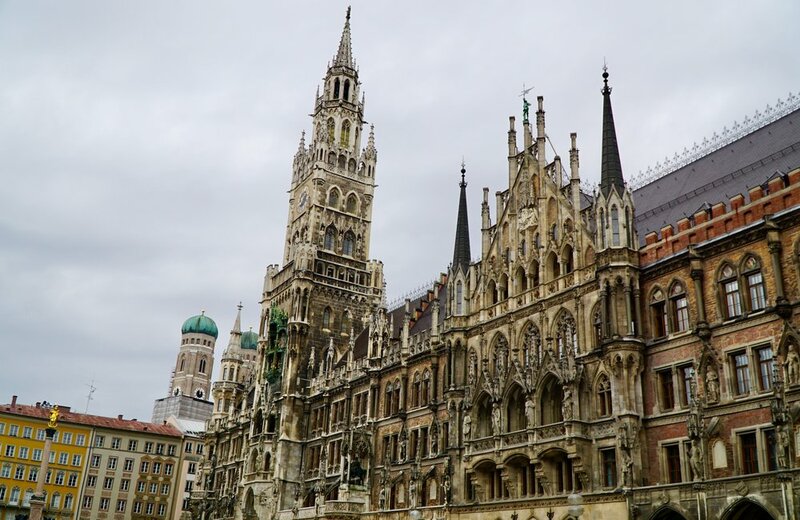 The Rathaus stood primly, a muddy frilly wonderland of a building, with its ringing clock and parading marionettes. In the immediacy were streets of pastel-coloured buildings that all rose to that bouncy triangular tip so common in northern Europe. Churches were everywhere - this being a devoutly Catholic place; either slotted into the row of homes and only noticeable by a hanging Christ or inlaid statue of a saint, or sprinkled here and there about the city, and made from red bricks. Then around another corner would be some hulking stony behemoth with columns and domes; like something adrift from London, or a religious temple absconded from Rome to enjoy the pig in south Germany. Then the parks, the Englischer Garten, a Hyde Park with Chinese temples and beer stands, trees and streamlets. 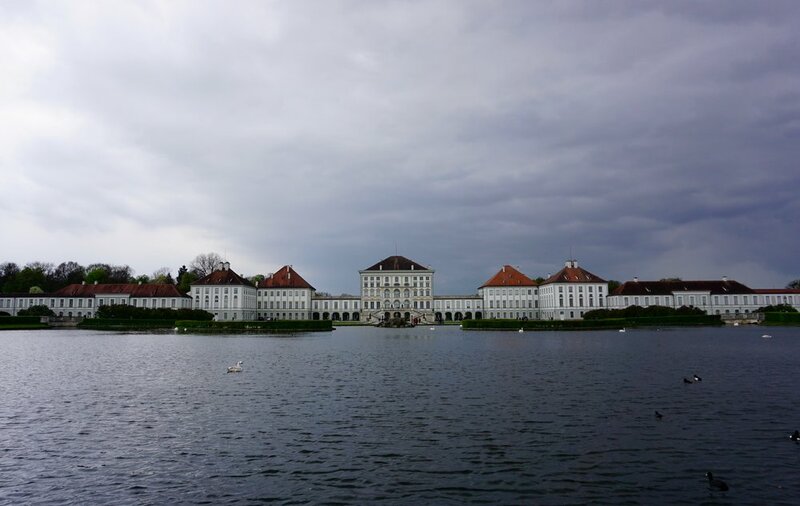 Between vast steins of weissbier we dodged beer gardens and tourists to arrive, beaten under a heavy sky of raindrops, at the outstandingly plush Nymphenburg Palace. A Baroque summer residence nestled in a neighbourhood of canals and huge mansions that recalled the house at Cliveden. Munich, as well as its loud beer halls, was also a well-heeled city of money. Back in the depths of the centre we perused the waterways and channels of River Isar. Sleepy residences, islands, families throwing twigs into the rapids, churches and art nouveau chimneys of ornate power plants added texture to this more sedate part of the Bavarian capital. The first stop was opened by a wonderfully named lush called Georg I Schneider in 1872 and, after a spell at the famous Hofbraühaus, became the first commoner to be granted the ‘Weissbierprivileg’ - the privilege to brew wheat beer. The elegant old tavern, less barnstorming than its neighbours, took a beating during the war, but was restored and provided a calmer place to tuck into our first dish. Already on the table were homemade Brezel (pretzel) with their sweet bread flavour and crunchy salt studs. 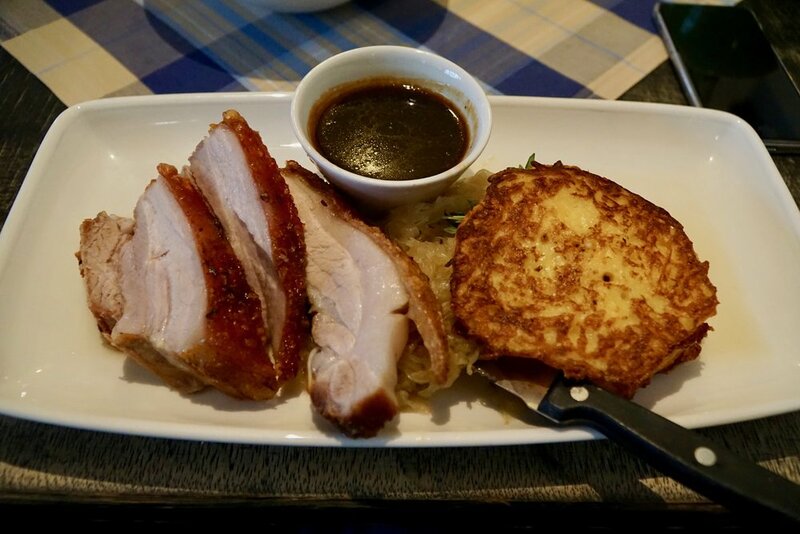 We ordered tall, gassy and refreshing wheat beers and plates of Bierbratl, crackling-lined juicy braised pork, cooked in the tavern’s Aventinus beer, and served with sauerkraut and some potato pancakes called Reiberdatschi. We opted for a refreshing side dish of Krautsalat too - a zingy mayonnaise free coleslaw beloved of the Bavarians. The following morning we returned to Schneider’s to sample the speciality of the house. Breakfast, at 11:30am, was weisswurst: white sausages of veal and pork-back bacon and spiced with parsley, mace, lemon, onions, ginger and cardamon. They are poached lightly, enough to cook the meat but not colour the sausage. One doesn’t eat the casing; you cut the sausages open and shimmy the meat out. They are served fragrant and warm in a little pool of water in a porcelain bowl; on the side more Brezel and a pot of sweet German mustard. Not too much to report on this 1589 institution and tourist carnival. We drank quite a lot. Hugh litre steins of dark beer. The Hofbraühaus is a mad, screaming and chaotic labyrinthine cathedral to drinking and had to be experienced. The painted vaulted ceilings, the racks of privately owned and locked-up steins of the local drinkers, the pretty waitresses offering snacks like flower girls in Victorian London, the busy waiters in lederhosen carrying unimaginable numbers of giant glasses in their hands, the constant human traffic of cameras and bewildered travellers. We had to go; but we didn’t eat. 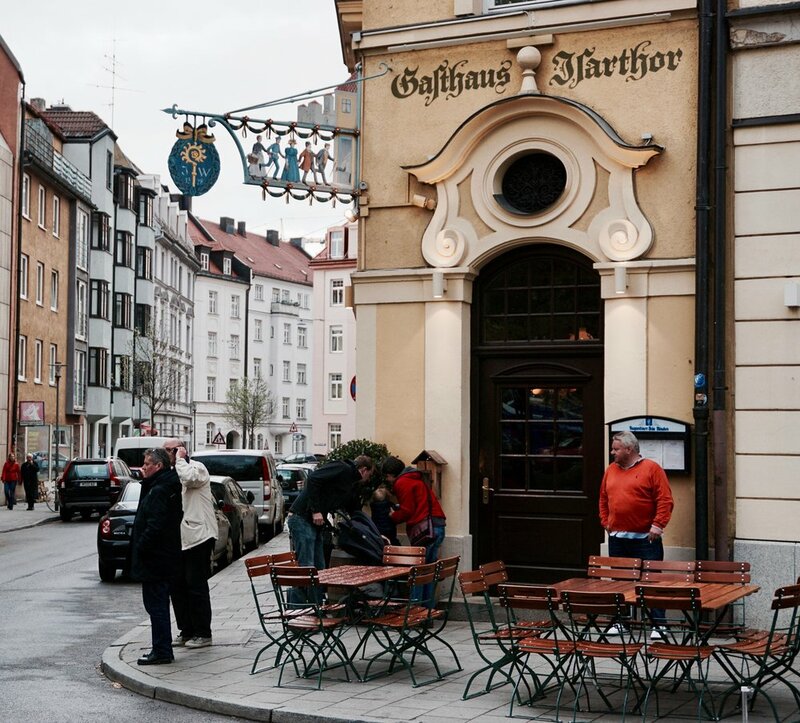 A classic tavern in the shadow of Munich’s opera house, we arrived here after many beers. We needed something lighter. A break in the pork. We ordered Obatzda, which swiftly became a surprise favourite. A Bavarian speciality, Obatzda is a creamed blend of aged camembert, butter, sweet and hot paprika, salt and pepper, and a dash of beer. It was served, an attractive light orange glob, with some dark bread and fresh raw red onions. Awful for the breath, but bright and fresh on the palate. Cheesy and spiced. It was a remedy to our distending bellies. But, to the wall with health. We demanded sausages! A last stop before bed. We slumped ourselves down heavily and ungraciously - despite my tweed jacket attempting to give a certain air of class - at a table outside this home of sausages. Inside was dark and full of wood and stained glass windows and a porcine smoke. Beautiful, but we needed the air. Behind us standing proudly, was the main Munich church, the Frauenkirche, an almost absurdly massive brick building with two sensationally tall and imposing towers. We ordered a mixed plate ‘Glöckl Reine’ that arrived as a variety of hot off the grill wursts surrounding a bed of more pickled cabbage. A Käsekrainer (a big sausage filled with cheese), four small grilled sausages and a Munich sausage, that was more red in colour. We had met our limit for day one and stumbled and passed wind all the way back through the streets, not forgetting to shine the nose of the hog statue that sat near the old entrance to the Altstadt. Just sitting outside the old town limit was this little gem. Isarthor is one of those intimate locals haunts that mostly escape the tourist hordes by virtue of its a) not being next to a main square and b) being a bit ‘too local’ in its vibe. This not a place for the guidebook wielding Doris from Idaho. I’m a pretty good tourist, and Germany’s pretty easy, but even I was a little flustered. But it was a wonder. Old wooden tables, noisy patrons drinking in un-ironic lederhosen - the perk of arriving during a holiday - families gathered around eating hearty plates of artery-clogging goodness, functional beer kegs behind a small oak bar. Perfectly dingy and Bavarian. We ordered bowls of a local obsession and ideal hangover cure: Käsespätzle; Germany’s original answer to Mac ’n’ Cheese. Soft and gooey pasta with stringy cheese and caramelised onions on top. I would go back to Isarthor in a slow pork fat-wrapped heartbeat. Just be careful to not to sit at the ‘regular’s table’; Stammtisch. Check for a tiny photo of a drunk German man above a chair and you’ll know. We had many days of eating to come and Munich was starting to test our belts. On a rain-soaked evening after a wet day to Neuschwanstein Castle, we decided to dry off inside the obscenely raucous and lederhosen-filled Augustiner Brau. Despite being the oldest brewery, dating back to 1294, the current cavernous tavern dates from 1829. Warm, louder than a landing plane, bursting at the Bavarian seams with drunk singing men in those German pantaloons, Augustiner provided an environment of long medieval-style elbow-to-elbow tables. Sat next to some chatty young Germans, we ordered oven-baked pork, served in that classic beer sauce with more potato dumplings, cabbage and a sweet dark fruit chutney. A sweating brow and a back-arching inhaling wheeze had become par for the course in Germany. It was the last night in Munich and it was snowing. Snowing in April. Under a somewhat surreal and immensely beautiful snow globe shower, we headed for one last overblown giant beer hall: Löwenbraükeller, from 1861. The opposite to our previous taverns, this was high-ceilings, dark wood beams and white walls. Bright and airy. We ordered two litre steins of very dark and very strong local beer - most of these places still brew their own - and plates of another local favourite: Leberkäse. The dish translates, somewhat unfortunately, as ‘liver cheese’. It is in fact similar to Bologna sausage: corned beef, pork and bacon minced up with onions and baked in the oven. Traditionally, as in Löwenbraükeller, it is served simply with potatoes and fried eggs. I couldn’t possibly stay in one place. My feet, they itched even though I was already scratching them by being out of Spain. Gastro-cultural excursions within in an excursion were necessary. First a car was hired and then, via wrestling with the on-board German female GPS voice, we were able to scream out at frightening speed, autobahning through green fields, undulating hills - occasionally topped with absurd castles like that at Hohenzollern - under a leaky ceiling of grey clouds to the legendary Schwarzwald, the story-told Black Forest. Before reaching our verdant enclave of Freiburg, we took tea and cake in the chocolate box village of Gengenbach. A sweeter and more enchanting place you couldn’t create with the imagination. Multicoloured criss-crossed houses filtered around cobbled squares and lanes stuffed with fountains, benches and pot plants. Browns, creams, reds, duck egg blues, mustard yellow, teal, colours, colours, colours. Who knew the Baden-Württembergers had such Mediterranean leanings. Then Freiburg deluged into play, threatening to ruin our mood. Itself an odd mix of Saint Petersbrugian tramways and miniaturised grandiosity blended up with those Hansel and Gretel turrets, clocks and towers. The cathedral was gloomily gothic with its wet terracotta but there was a sense that we were there at the wrong time. Quiet, closed, rain-beaten and shy. But this was Europe. There was always something to put in one’s face. First, out of the rain, we took the advice of our somewhat bohemian landlord and headed to this marvellously named bar. Hipsters, cool young folk, ‘normal’ people, and a couple of plucky bedraggled foreigners, all took solace in this bar. We enjoyed their generous list of regional wine, for now we were entering Germany’s wine regions. Specifically Baden. The food was all sandwiches and pizzas so we just imbibed. Only one place was open and befitting of our ever-straining pursestrings. Löwen was a small, homely, family-run affair. A cosy restaurant, the wall bedecked with photos of family members and guests. I ordered us a bottle of Baden Spätburgunder (Pinot Noir), which sadly fell way short of pleasing me. I’m not a ponce, but the wine had lost its backbone down a wet drain somewhere. It is a cool climate, yes, we bought the cheapest one, yes, but it was just tart fruit juice. The meat, however, was filthy. 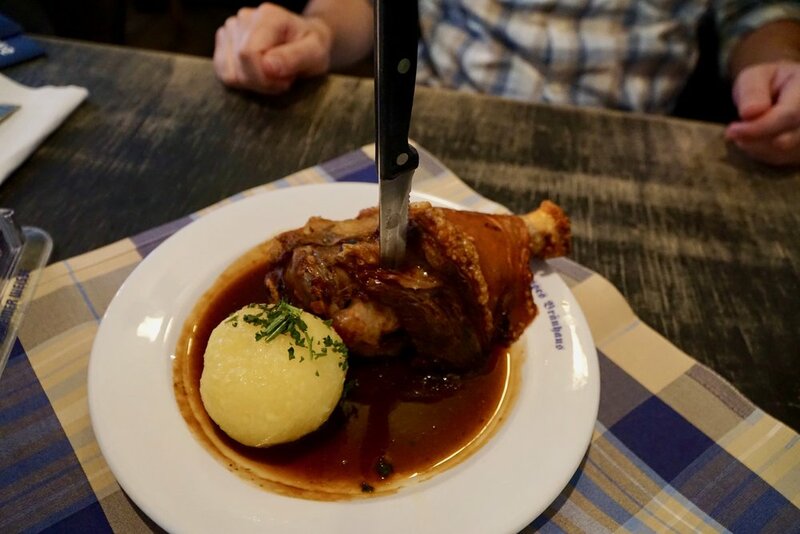 The legendary Schnweinshaxe; the pork knuckle. Mine had seemingly been broiled and then fried to a meaty crispiness. It came mit pommes, with fries, and an out of place, but wonderful tartare sauce. 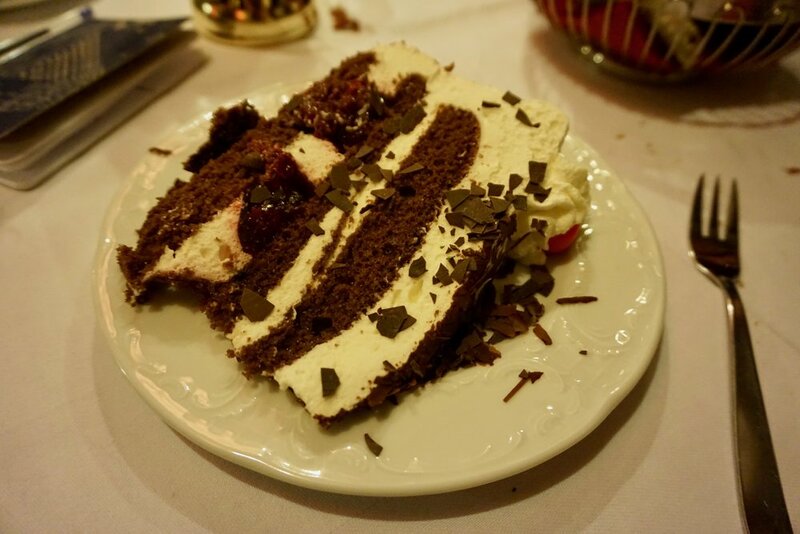 Before leaving, there was an obligatory food to tick off the proverbial list: Black Forest Gateaux, or, as it’s known in the Black Forest, Schwarzwälder kirschtorte (Black Forest cherry cake). I don’t have a sweet tooth in general, but this was a lazy and disappointing excuse for a cake. An abundance of light sweet cream pumped in between some flimsy pieces of chocolate sponge and infiltrated with globs of cherry. We left thinking: beautiful area, shame about the food. The following day at least made up for it with startling beauty and great wine. A sun-drowned morning was spent driving around the staggered, terraced vineyards and villages that made up Baden’s premiere wine sites in the exploded ancient remains of an old volcano: the Kaiserstuhl. We passed Kiechlinsbergen with a coo, and in Endingen we took coffee and cake and gawped at the enchanting Grimm fairytale houses. After a brief and surreal rise into the heights of the Black Forest - where snow and white pine trees and Austrian-style lumber mansions seemed to reign - we descended into the sunshine once again to the shores of Lake Constance (Bodensee). After the LSD Baroque wedding-cake pink nonsense of Kloster Birnau, we alighted at the wonderful village of Meersburg. No bigger than your fist, but it had gorgeous houses, lakeside views, colourful walls, a palace, a medieval castle and vineyards. At this cute little wine-focussed restaurant, a stone’s throw from the lake shore, I opted for a Flammkuchen - Germany’s answer to a pizza - covered in crème fraîche, speck and cheese. To go with it a glass of wine made by the village itself. A crisp, apple-y glass of Müller-Thurgau; a grape that so often made unassuming wines, and is finding itself being planted less, but that can make wonderfully dangerous wines. The focus of this day - one full uncomfortable day bursting with various trains and transfers and jostling for space with somewhat obtuse Asian tour groups, then sleet, rain and snow - was not food, but arguably the most famous castle in the world. One of those Disney inspirers: Neuschwanstein. Despite the aim being that amazing 19th century lunatic building, and not forgetting the lower down mustard yellow cousin Hohenschwangau, sustenance was necessary. It was a long walk up of course. And despite the surreal beauty of those white towers and Gothic roofs perched on a stubby hill powdered white by a low snow-flinging sky, my toes were wet and my stomach empty. We spent a while pootling around the very twee, but often missed, village of Füssen. Gingerbread houses in a range of pastel hues held two fingers up to the rain and welcomed the tourists who weren’t just there to get the castle bus right away. This was a modern bistro, thankfully calm, quiet, friendly, cosy - as per the German tradition, and welcomingly untouristy. We started with a soup that became a favourite of ours: Flädlesuppe: a broth cooked with onion, bacon, and veggies like carrot or celery, and with strips of potato pancake floating in it. Bizarre, but light and warming. Then came my ‘every time I’m in Germany I must have’ option of Currywurst; those little diced chunks of sausage served with a spiced ketchup, a sprinkling of curry powder and chips. Germany was done. My arteries were wheezing and my heart was straining to beat. Problem was, we now had to eat through Austria.